Have you ever heard of any news app that can read the news in multiple languages, which covers top stories of the day for each category and give you news in just 60 words? Well, we are here with an app just like this that will surely blow your mind. Yes, here we are talking about none other than Awesummly. India’s first algorithmic short news summary app for all languages. Here you can also customise your settings according to your preferences for the type of news you wanna see. This app is extremely compatible with all android devices. There are lot more features of this app. Isn’t this Awesummly app awesome just like it sounds? Now let’s have a quick flash at the backdrop of the app. Awesummly was founded in December 2015, co-founded by Nithin Mishra who is the chief executive officer along with Ankit Dhawan who is the CMO and Deepak who is the CTO respectively. Just like other big companies today. The idea of Awesummly was also created while having a casual talk and purely accidental. The co-founders of Awesummly had a thought-provoking question when they were sitting across a table in a restaurant and discussed the missing Malaysian flight. The flight number was not known to them, and this very lacking on news facts brought the idea of Awesummly into their genius brains. The development of this news app is tremendously valuable to people for reading short summarised news in real time. It follows a unique technology that summarises any news article within couples of seconds.Not just this, Awesummly also does not translate the article instead it summarise it in the same language. As of now, Awesummly partnered with media house to summarise their content and helps them by providing traffic on their website. Getting towards the funding part of Awesummly it is popularly known that they got their initial funds from The Vault Show. 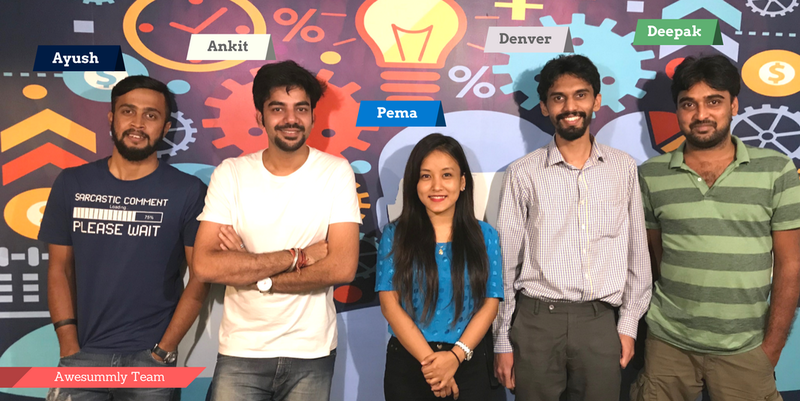 Apart from them, Awesummly has received a significant amount of funding of about $146k from Vivek Bhargava, chief executive of Digital Marketing Agency and Ameera Shah promoting manager of the Metropolis Healthcare. The happy users of this app include many famous personalities. It has also been recommended by Shobhit Mittal, Rajeev Singh. The users of this app are mostly youth belonging to the age group of 18 – 28. They have many competitors like ‘daily hunt’ and ‘news in short’ which summarises manually. 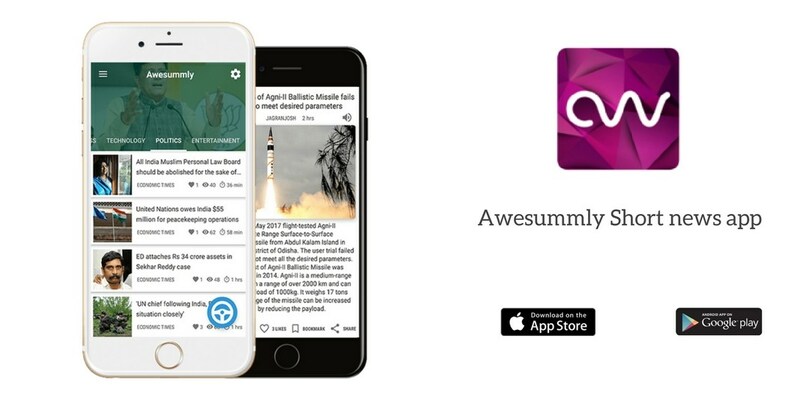 For now, Awesummly has created a benchmark in the news world. Success comes only with hard work. This is very true for the fact that it took a lot of pain for the co-founders in surveying out of several tech parks and offices asking about the news and how frequently people read the story. It was found that many techies didn’t have enough time to run through the long news articles in a day. Hence Awesummly came up with something short and simple which would help them get the fastest and the latest news in real time. Also, it is compatible with all android devices and covers only about 3.9 MB space whereas other news apps take up more space than this app. It has achieved a 4.7 rating on play store. The creation of this app is an innovation and is running quite well in India. With only nine members of his team, Nithin Mishra has proved to achieve success in this short span of time. The three co-founders with their experiences in their work field, each one of them have brought excellent results and have used all their ability and passion for making this real. When asked in several interviews about their inspiration, all the three co-founders have the same motivation, Vijay Shekar Sharma, the CEO of ‘Paytm.’ All three aim of reaching the height where paytm is today. Initially, they worked on only two languages, one being English the other Hindi. Recently they have launched in several regional languages. The secret for Awesummly news app’s success is the technology-driven business experience. This short news app has got its name and fame in the digital world. It has bagged several awards at the national level and has received worldwide recognition. It has been proven to be the best in India by several app users. This news app has been designed based on user preference and choice. Since the company was bootstrapped initially, the co-founders faced a huge downfall, but later when they reached a stable point, they have had a sigh of rest. There have been some researches done on this very app. According to one such Nelson Norman Group Research, many news readers due to lack of time and just because digital media can fit in massive length of news, the readers pick out only the essential lines and side headings. Awesummly is one cure for all these issues. It provides the shortest summarised news in about 60 words in real time. People don’t have to often worry about the news related assumptions. This news app gives a clear picture to the reader. This news app has many options by which you can plan when to read which news. You can save for later reading or can run through news at night before hitting the bed. Awesummly is a well-established start-up belonging to middle-class families without any business background or business sense and has left a benchmark to other young start-ups to create an impact in the world. Awesummly has set high standards for budding entrepreneurs. Currently, they are working on launching ios and redesigning the android app. We are just waiting for what this wonderful team has to give us in future. We wish them luck for more success in future.